The Brightline™ Initiative develops and provides a holistic knowledge and networking platform that delivers solutions and insights to successfully bridge the expensive and unproductive gap between strategy design and strategy delivery. Brightline is dedicated to help executives, specifically the Chief Strategy Officers (CSOs), Senior VPs, and Executive Directors of large enterprises regardless of their industry or geographic location. 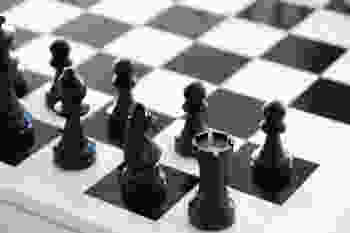 Any professional who is responsible for the results or management of strategy implementation within their organization will benefit. 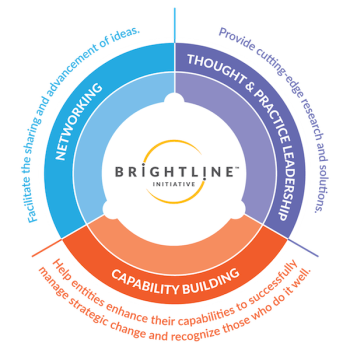 Brightline provides organizations with three key benefits that will improve their ability to deliver on strategic intent: Thought & Practice Leadership, Networking, and Capability Building. Brightline gives organizations the cutting-edge research and solutions they need to better implement their strategy. The emphasis on ‘practice’ in addition to ‘thought’ complements the Brightline Initiative’s focus on bridging the gap between formulating a strategy and delivering it. ‘Practice Leadership’ includes tools such as frameworks and assessments that support executives in delivering the strategy. Through networking opportunities, executives can exchange experiences and advance ideas and practices related to strategic initiative management. Through capability building offerings – such as resource libraries, executive education programs, assessments and certifications, and publications – organizations have the chance to further develop knowledge and expertise. The Brightline Initiative is led by the Project Management Institute (PMI), a nonprofit professional organization, in partnership with a coalition of senior leaders representing influential organizations from the business, government, academic, and social sectors. PMI is the premier professional association for project management, delivering value for more than 3 million professionals working in nearly every country in the world through global advocacy, collaboration, education and research. Agile Alliance is a nonprofit organization dedicated to promoting the concepts of Agile software development as outlined in the Agile Manifesto. Agile Alliance organizes and supports events to bring the Agile community together on a global scale. Saudi Telecom Company (STC) is the largest telecommunication service provider in the Middle East and North Africa based on its market value. It has about 100,000,000 customers worldwide to whom it provides high-technology knowledge-based innovative solutions. Lee Hecht Harrison is the world’s leading talent development and transition company. NetEase is one of the largest internet companies in China and has long been a pioneer in developing top internet applications and services. With a strong sense of purpose, NetEase leverages its advanced technology and R&D capabilities to provide quality products and services, moreover to enhance the information exchange among users, ultimately to “bring power to the people”. The Technical University of Denmark (DTU) is at the academic and multidisciplinary forefront of the technical and the natural sciences—with new initiatives in a number of demanding engineering disciplines, including sustainable energy technology and life science. The Consortium for Engineering Program Excellence (CEPE) at MIT is leading research grounded in model-based project design methods and workplace learning. Research topics include processes for the identification and evolution of strategic implementation targets by executive teams, and the relationship and methods of strategy implementation and organizational learning and capabilities development. The Blockchain Research Institute is a knowledge network organized to study the strategic implications of blockchain. Our syndicated research program aims to fill a large gap in the global understanding of the second era of the internet and its impact on business, government, and society. Insper is a non-profit center of education and research in the fields of Business, Economics, Law, and Engineering, exploring their complementarities to positively impact organizations and society. Part of Duke University, Duke Corporate Education is the premier provider of leadership development offerings, focused on getting leaders ready for what’s next.